On the now dead planet P5C-353, SG-1 finds a small orb with an amazing power source. 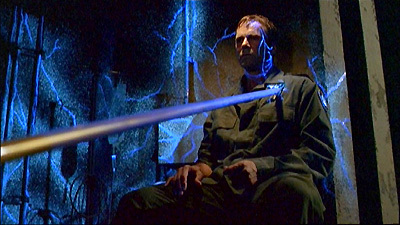 They bring it back to Earth for study, but the device activates, anchoring itself in the facility with metal spikes, one of which pierces O'Neill's shoulder, pinning him to the wall. Worse, a microscopic organism is infecting not only O'Neill but the facility itself. As the base's self-destruct mechanism counts down, the organisms begin to communicate through O'Neill. Having slept for millenia, they seek only a living world, and a compromise with Earth so that both may survive. Millennia ago, P5C-353 was dying. The organisms created the orb where they slept for 100,000 years, waiting for someone to take them through the stargate. Once exposed to the atmosphere of a living world, they went forth and multiplied. So it was written on the orb. The orb is made from several unknown materials including two new elements and a non-terrestrial alloy shell several hundred times stronger than steel. It maintains an interior temperature of 33 degrees Fahrenheit, generates an electromagnetic field, and emits small amounts of alpha, gamma, and delta radiation, using an advanced power source that lasts for thousands of years. In a living environment, alpha particle generation increased, and the temperature rose to 149 degrees. The organism is mobile like a bacteria, small like a virus, slightly radioactive, bonds in chains, and causes an infection and high fever which responds temporarily to antibiotics. It reproduces exponentially, needs oxygen but goes dormant in an anaerobic environment, feeds on energy, and metabolizes virtually any substance as if it were living tissue, similar to necrotizing fasceitus, or flesh-eating disease. It is capable of communicating through others once reaching critical mass. The organism identifies itself only as "We". Hammond initiates a Wildfire Directive (authorization code red dash beta), requiring level 4 quarantine, internal power and life support, and nothing in or out of the mountain. In the event of containment failure, Wildfire kicks in automatically. The SGC sent the orb and the organisms to P4G-881, a primordial world. One small step, one giant leap, that kind of stuff, Sir.